A Building Roam: Free Manny! Two of my favorite sports entities have decided to hang it up. 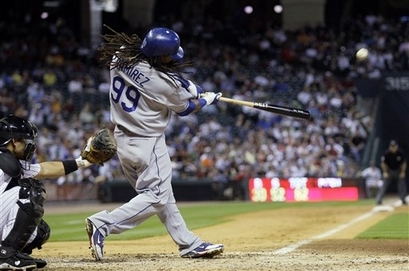 Controversial-yet-comical baseball slugger Manny Ramirez abruptly retired this weekend after learning of a failed drug test (his second one) and, rather than sit out with a 100-game suspension, the 39-year-old superstar decided to end his baseball career. At the same time, the basketball writing collective known as FreeDarko made their final blog post today and have decided to disperse as well. I arrived very late to the Free Darko party, only hearing about them 6 or 7 months ago when I picked up their first book, The Macrophenomenal Pro Basketball Almanac. I quickly devoured that book (read my review here) and joined the chorus of ardent admirers of these basketball philoso-aestheticians. I'm still in the midst of reading their second book, The Undisputed Guide to Pro Basketball History, but I can say that I've frequently found myself bestowing laudatory praise upon it, describing it as literally one of my favorite books ever. Everything about that book is wonderful. Their two incredible books sprung from the writing on their blog freedarko.com and the huge following they attained. As the main components of the FreeDarko collective (the writer known as Bethlehem Shoals and the artist Jacob Weinstein) have now decided to go on to other pursuits, the website and the legendary title associated with it have now called it quits. It's terrible news, especially since I only just recently started checking their work, and it will surely affect my appreciation for the NBA. If you're at all curious what they were all about, you should read their huge final post in which everyone who's ever written for the site describes what FreeDarko meant to them. I wish the FreeDarko guys would have drawn up an image of Manny Ramirez. In my sports-watching life, I've never seen anyone like him. 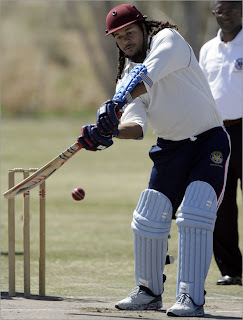 He would step up to the plate wearing the baggiest uniform you've ever seen, his beard all scraggly with a huge wad of gum or tobacco in his cheek, his enormous sleeves covering most of his muscular arms, and an unbelievably long hairdo of dreadlocks upon which his batting helmet barely fit. He was a mess. And yet when he swung a baseball bat, all those loose, scraggly items were seemingly shed in a supernova display of pure symmetrical, mechanical brilliance. The man was born to hit a baseball and for his entire career, he did it about as well as anyone ever has. But he certainly wasn't born to be a public figure. He was childish, pouty, lazy, and not very articulate. As great a player as he was, he is viciously hated upon by a good number of sportswriters and he's an extremely polarizing figure among baseball fans. He never played for any of my favorite teams, but I always considered him one of my favorite players because it was such a joy to watch him play. He started out as a showy masher of baseballs, frequently hitting loud homeruns and remaining in the batter's box to admire them. With the powerhouse Cleveland Indians of the 90s he went to the World Series and led the league in slugging a couple times before signing with the Red Sox. He became one of the most popular players in baseball with the Sox and eventually led them to their first World Series title in 86 years with a second title coming three years later. In his last few years with the Sox his hair grew longer and longer into tweedy dreads and his threads got increasingly baggy. His cap and his helmet always popped of his head when he ran for a flyball or rounded the bases and he dragged around his shaggy clothes like a kid in a ghost costume. Baseball purists hated him. I see the Manny experience as a wonderfully colorful and quirky episode in the game's storied history of characters. When he was traded to the Los Angeles Dodgers he exploded upon the National League (hitting .396 over the final two months of the season) and elevated his star status even higher while carrying the team to two consecutive NLCS matchups with the Phillies. It became a national news story when the team asked him to cut his hair which was getting out of control. Everything about him looked sloppy, baggy, disheveled, except for his perfect swing which would often lead to a crisp "thwack!" and a lifted line drive. That's what I've always found so intriguing about him. No matter how dumb he seemed, no matter how crazy his hairdo, or how loose-fitting his uniform, the man could always crush a baseball with the utmost powerful precision (an achievement not nearly as brutish as it sounds---in fact, it's probably the most difficult thing to do in all of sports). And he knew it. 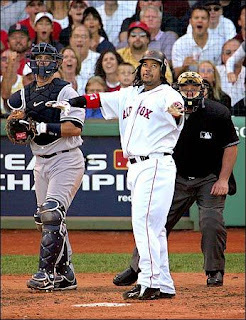 Although there are actually two other big hitters with the same last name (Aramis and Hanley Ramirez, all three of them unrelated) and the same penchant for admiring their homeruns, I've never seen anybody make such a comical show of himself at the plate after a homer as Manny. The one that sticks out in my mind is a game-winning smash against the Angels in the ALCS when he simply stood in the batter's box with his arms straight up in celebration before finally jogging slowly around the bases while chaos ensued in the stands. I was really looking forward to watching how things would unfold with him playing in the AL East again, battling his old foes (and friends) as the Tampa Bay Rays' designated hitter but he has suddenly departed. We'll never get to see Manny hit a baseball again because he somehow managed to fail a drug test for the second time in three years. At the very least, his departure is perfectly Manny. Controversial, puzzling, stupid, and shocking. Sticking it to the man without any regard for how badly it hurts his fans. Only this time, we won't be able to forget about it all while watching his pretty swing.